An all-diamond ring custom crafted from a single rough gem is expected to fetch up to $250,000 when Sotheby’s offers it for sale December 5 at the third (RED) Auction in Miami. Proceeds from the sale will support HIV/AIDS programs in Africa. Conceived by Sir Jony Ive, Apple’s Chief Design Officer, and renowned industrial designer Marc Newson, The (Red) Diamond Ring will contain no metal elements. The lab-grown rough diamond will be carved into a ring shape by master cutters in Antwerp using laser beam and water jet technology. It will come to life by removing material rather than adding it. 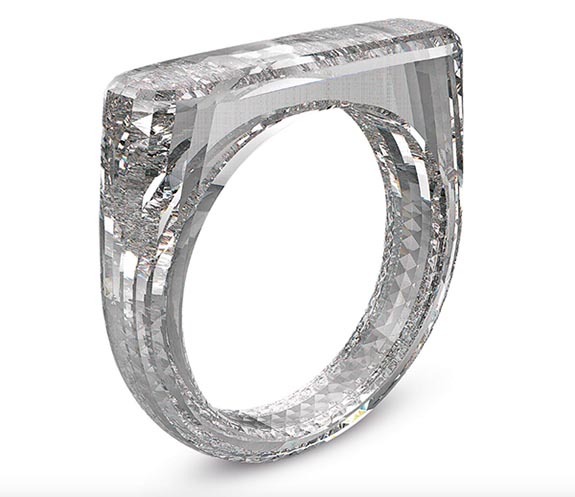 In the end, the ring will feature between 2,000 and 3,000 individual facets, some as small as several hundred micrometers (1,000 micrometers equals 1 millimeter). According to Sotheby’s, the ring’s interior will be cylindrically cut for the desired smoothness using a micrometer-thick water jet. The ring in the photo, above, is conceptual. The actual piece will be custom-made for the winning bidder in any ring size up to 5. Sotheby’s set the pre-sale estimate at $150,000 to $250,000. Shawish Geneva was the first company to form a ring from a single diamond. Shawish unveiled the innovative ring to the public during the 2012 Baseworld Watch and Jewelry Show. That ring was laser-cut from a 150-carat rough diamond. While the Shawish ring was certainly groundbreaking, the Ive-Newson design is said to be more wearable. The company responsible for creating the lab-grown rough diamond for this project is San Francisco-based Diamond Foundry. The rough is expected to be larger than 45 carats. The (Red) Diamond Ring will be auctioned by Sotheby’s during Art Basel Miami. Previous (RED) Auctions have generated $68 million for AIDS research. Credit: Image courtesy of Sotheby’s.